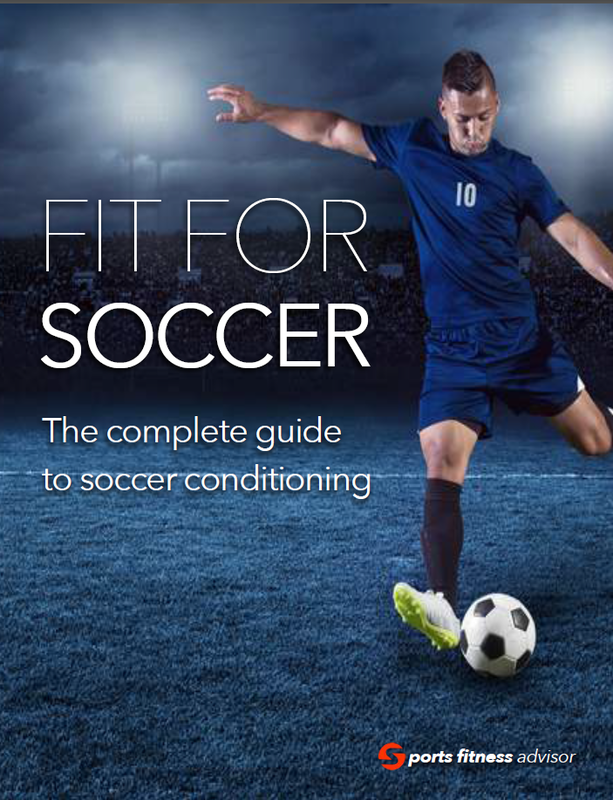 But that doesn’t mean you can’t significantly improve your soccer-specific fitness. It doesn’t require any expensive equipment… other than a pair of light dumb-bells. Here’s a 7-day view – I’ve numbered days rather than using days of the week. Change the sessions to fit your own routine. Ideally, avoid training the day before a game and leave at least 24 hours between sessions. Start by warming up – 5mins of jogging on the spot, high knees, heel flicks, jumping jacks etc. Do 5mins of stretching to all major muscle groups. Rather than running at a continuous pace, why not make it much more soccer specific. Soccer conditioning should involve running, jogging and sprinting in no set order. Use level of fatigue to determine when to sprint or when you need to jog or walk or whatever. So, on a scale from 1 to 10 (1 being a walk in the park, 10 being and all-out, gut-wrenching slog) keep your session at about a level 7 throughout.If you need to jog most of the way that’s fine. Build up over a period of weeks to more intense sessions as you become fitter. Again rather than just running at a set pace, here you jog, cruise, jog, sprint, jog, walk and then rpeat the cycle… jog, cruise sprint, walk. This session is not designed to be as intense as the Fartlek run earlier in the week. Instead focus on running form – an upright posture, keeping your elbows and arms in a straight line. Each jog, cruise, walk or sprint should be no more than 20 yards. Really focus on maximum speed in the sprint and maximum form in the cruise (about 75% top speed). The jog should be very slow to allow you to get your breath back. If you need to, walk and jog further distances to fully recover before sprinting again. At the end of your sessions (and at the end of a match if you can), stretch the hamstrings, groins, quads, calves and lower back. Hold each stretch longer than you do in the warm up – 20-30 seconds. Do 2 stretches per muscle group. 6 weeks before the season starts why not throw in an extra session on the day you would usually play a match? Three routines like those above will do far more for your games than simply running continuously for half and hour.